Another stellar recipe from The Sister’s Cafe – these cookies are delicious! A yummy alternative to traditional sugar cookies, these are easier because you don’t have to roll out the dough and cut out with cookie cutters. You simply roll into balls and flatten with a glass and sugar. The texture is soft and melts in your mouth. These are fantastic with or without frosting. Yum! Mix all ingredients well. Roll into golf size balls and place on cookie sheets. Flatten with bottom of glass dipped in sugar. Bake at 350 for 12-14 minutes. Cool and frost with sugar gem frosting. For the frosting, mix well and add a little more milk or powdered sugar to get the right consistency. could not find oven temp. did I miss it? Would love to bake these for Christmas day. They bake at 350 degrees. 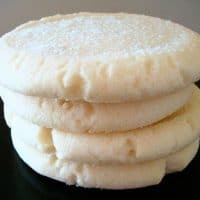 I discovered this recipe just the other day searching for a sugar cookie (my favorite kind) that I did not have to roll and cut out. I made a batch and my whole family agrees that these are quite possibly the most addictive cookie ever! Delicious both with and without the frosting; beautiful, easy and YUMMY! Thank you Mel! These will be a regular for us. 5 cups of flour? I followed amounts exactly, and that is waaayy too much flour. Do I have to pitch it? I hate to waste all these ingredients! Thank you for any help! I *think* my problem may be that I used coconut oil. Just a warning to others considering the coconut oil! I would feel so silly, if I were not so relieved! The cold eggs caused the coconut to solidify. Once I warmed it back up, it created a beautiful dough! These cookies are so delicious! Hello Mel, I’m thinking of making these. What kind of oil did you use. Would refined coconut oil melted work? That is all I have apart from e v olive oil which I would think would have too strong a taste. Thank you. Yes, that would work! I usually use avocado or grapeseed oil (or canola oil in a pinch). I am 9 and made these.YUMMY!!!!!!!!!!!!!!!!!!!!!!!!!!!!!!!!!!!!!!!!!!!!!!!!!!!!!!!!!!!!!!!!!!!!!!!!!!!!!!!!!!!!!!!!!!!!!!!!!!!!!!!!!!!!!!!!!!!!!!!!!!!!!!!!!!!!!!!!!!!!!!!!!!!!!!!!!!!!!!!!!!!!!!!!!!!!!!!!!!!!!!!!!!!!!!!!!!!!!!!!!!!!!!!!!!!!!!!!!!!!!!!!!!!!!!!!!!!!!!!!!!!!!!!!!!!!!!!!!!!!!!!!!!!!!!!!!!!!!!!!!!!!!!!!!!!!!!!!!!!!!!!!!!!!!!!!!!!!!!!!!!!!!!!!!!!!!!!!! Thank you Mel for this recipe! I am making them for the third time! Tinting them lavender colored for a baby shower. These are the Best sugar cookies!! I’ve been a silent stalker of your website for the last year and a half. Always good stuff. Just wanted to add, these cookies are absolutely delicious! I made these a few weeks ago and they were excellent! I’m making another batch for an event coming up. Can I make the dough ahead and refrigerate for 2 nights before I bake? If yes, should I bring the dough to room temp on the counter before attempting to bake? Thank you! Sure, I think you could do that. I would probably let the dough rest out of the fridge for an hour or so before baking (unless the cookies are already formed and pressed – then you can bake them straight from the fridge). These are sooo good. I love the chewy texture. I have a rolled and cut out cookie dough recipe that has a similar taste/texture but these are so much easier. I will make these again and again. Thanks for the recipe….I live in Canada and work at a bakery. Sugar cookies are a big seller at the bakery but so time consuming when you have to roll out dough and cutout shapes…..these seem very simple and quick to whip up….I think I will try them tomorrow. Ps….this is the first time looking at your website I think it’s great….keep up the good work! Thanks, Shirley – hope you love the cookies and any other recipes you try! I just made these and they’re wonderful! I used vanilla bean in the dough, and rolled these babies in homemade vanilla bean sugar! So good and beautiful to boot! This is an awesome cookie recipe on so many levels…first of all, it makes a lot in a relatively short amount of time, B) by rolling dough in colored sugars, it eliminates the need (but maybe not the want) for frosting, and last…they taste great! If I can’t get cream of tartar, is there something else I can use? Hi Maddi – I’ve never subbed anything for the cream of tartar. You might try googling cream of tartar subs to see what you come up with. stumbled across these on pintrest, was a little worried when i saw how much dough i had. but my goodness, it didnt matter because they got demolished so quickly. amazing recipe. im addicted to your blog aswell, its super neat. sending love with a full tummy all the way from south australia! Another terrific recipe from your site! Made these last week. They were so easy to make and so yummy! I love sugar cookies but am not always in the mood for rolling and cutting out. These sugar cookies are exactly what they are called- gems! Delicious with minimal effort! I have to admit I was a little skeptical about the icing with oil but it was actually a very pleasant surprise. Everybody who tried them, loved them ( except for my husband but that’s not saying much as he just doesn’t care for sugar cookies at all- I don’t know what’s wrong with him!). I will be linking back to you when I post this great gem of a recipe on my blog. Thank you so much! Ok…so these are very good for having no chocolate! So good!!! Every batch of sugar cookies I’ve made in the past 8 years, I’ve been looking for this texture! I use your blog for just about every dinner and stumbled across these by accident. I did not care for the dough but once they are cooked… yum!!! AmISparky – I’m loving all your comments. Thank you! I had never made frosting with oil before either until this recipe and it makes for a great texture. Did you add any flavorings to the frosting? Glad you liked the cookies! I’ve never heard of frosting with oil in it. I’ll have to try these out! Anonymous – yes, it is baking soda. I’ve changed the recipe to be completely clear. Thanks! Yum! 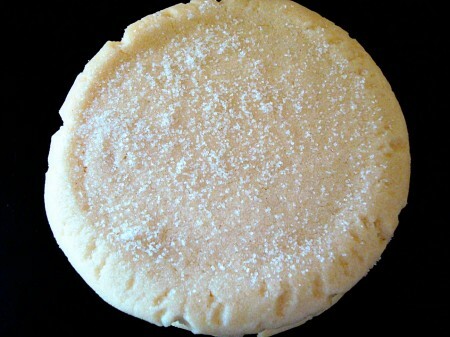 I just made the almond sugar cookies over at Leigh Ann’s blog that you sent her. I didn’y gey it posted yet, but they were great. I’ll have to try these now too. These really are a favorite of ours–I am glad you like them too. I have never tried them with cocnut flavoring–but next time I will! Yum! Glad you are feeling better! Mmmmm….these were so good! I ate some before and after the frosting and both ways are really tasty. I flavored half of the frosting almond and the other half coconut (because I couldn’t decide on one). Soooo good! Yum, these look to die for! I am a sugar cookie freak, so I’m sure I’ll be making these soon! Welcome all sugar cookie freaks and non-sugar cookie freaks (Jenna! )…these really are delicious. Hot Garlic – I don’t know if I would classify these as chewy – more like melt in your mouth and very soft. Does that help?? Yum! And I love that you don’t have to roll them out! These look like great sugar cookies. Very light looking! Jenn – glad you liked these. I like them unfrosted and frosted, too. Thanks for commenting and letting me know. Mel, you probably don’t know what a sugar cookie fan I am not…I’ve never made them in my life (can I admit that on a cooking blog?). But I do eat sugar cookies. But these look like what I’ve been waiting for, thank you!! I’m a sugar cookie freak too (like Steph), and those definitely look like they are melt-in-your-mouth good!! These look so simple and tasty!Hope you get better soon, take care of yourself! Yummy! These cookies are fabulous. The dough was a huge hit with my husband. I have never made frosting with oil before–it is wonderful. YUM! Are they chewy? Please tell me they are chewy! No, wait, don’t, then I will for SURE have to make them! Melanie – thanks for sharing this recipe! Sugar cookies are one of my husband’s favorite treats, so I’ll definitely have to give these a try! 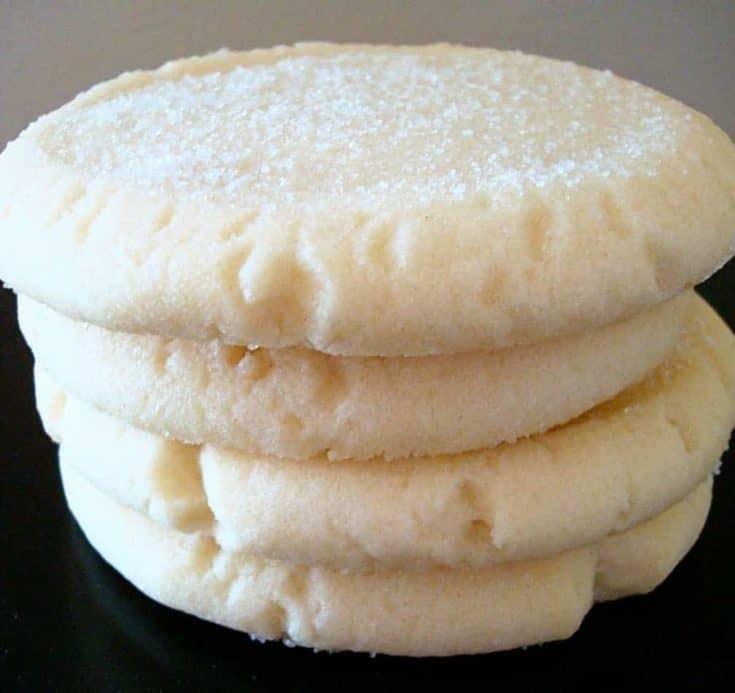 Melanie,You know what a sugar cookie fan I am – I will be trying these today. It is a cool, rainy day in Portland and we even had to turn on the furnace so I think these will be perfect. Just returned from dropping my daughter at college and am feeling a little sad so a good sugar cookie may be just the pick up I need.Wonder how they would taste with almond extract? Thanks for sharing! Is that baking soda that you add?